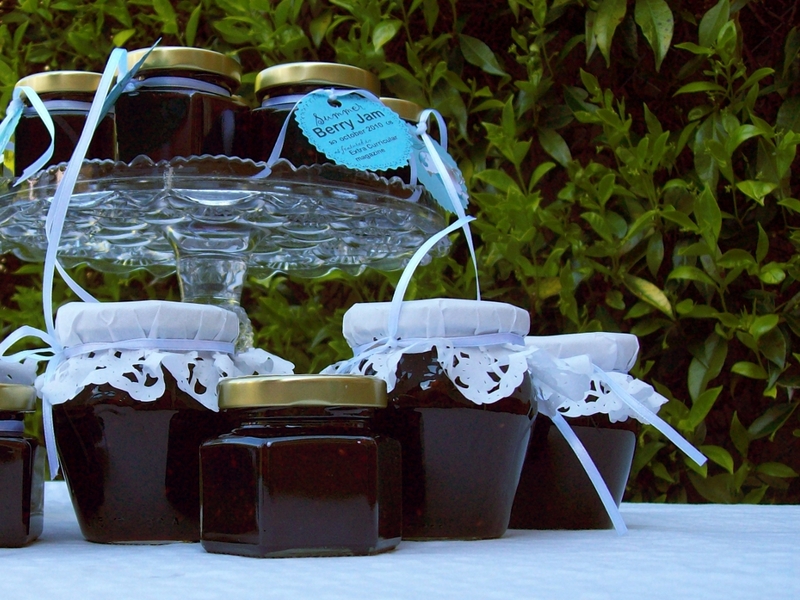 Jar labels make homemade jam look professional – even though it tastes better than anything you’d get at the store. I like to top my jar off with a pretty label made from – what else? – a paper doily. 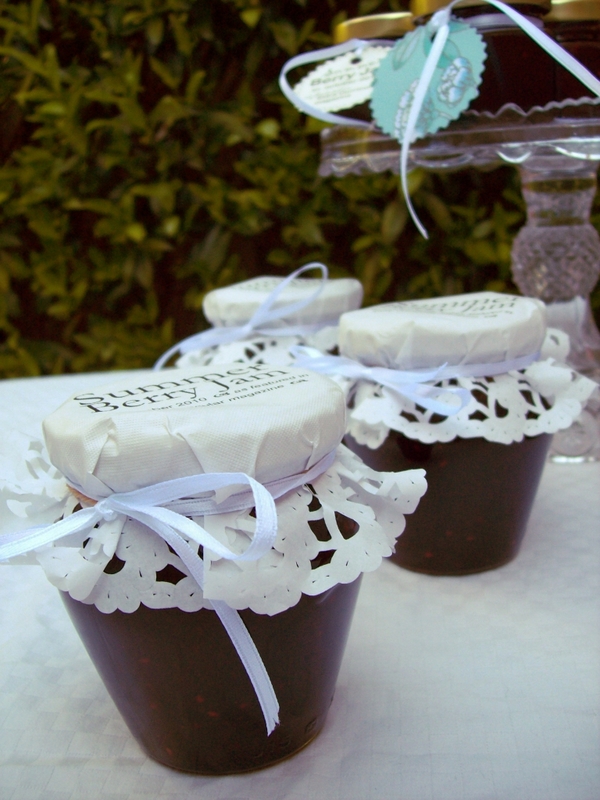 To make pretty canning labels like mine, you need a paper doily and a printer*. Find a bit of paper the same width as your paper doily, and in a word processing program, set the paper size to match. (My paper doily was 19cm – coincidentally the same as an A5 sheet of paper.) You’re going to need a few of these, so if you’re cutting them out of larger bits of paper, cut out half-a-dozen. Print a copy of your document (just on plain paper). How does it look? Place your doily over the printed area, and hold it up to the light: you should be able to see through the doily and see if the text box needs to be made bigger or smaller, or shifted about. You want your doily to be centred at the very top of the page, as high as you can get it while still making sure that the doily is completely backed by plain paper. Continue doing test prints until you’re happy with the label size and placement. Your design may need a lot of revision – that’s why we didn’t spend too much time on it in the previous step. Next, you need to check how paper goes through the manual feed of your printer. To find this out, on a plain sheet of paper, write “This Way Up” and add an arrow. Now, feed it through your printer’s manual feed. Which way does it print? To print using the manual feed of my printer at home, paper needs to be fed through face up and header up – but every printer is different, s o it’s important to know how yours works. Reread my warning below*, then grab a fresh piece of doily-sized paper and carefully position your doily on it. Remember, your doily should be centred at the very top of the page, with none of the boarder overhanging the plain paper. Hold this paper sandwich in both hands, and shove it into your printer’s manual feed. If your printer is anything like mine, it will reach out and ‘grab’ the paper from you. Press print, and gently guide the paper sandwich as it prints. 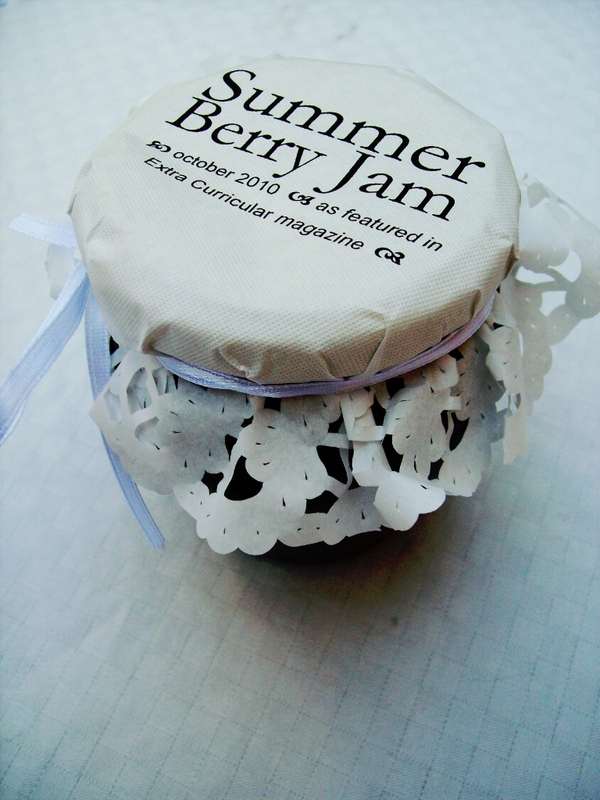 Peel the paper sandwich apart and place the paper doily over your jar. Secure with a rubber band, and tie with a pretty ribbon. Now you have a jar label template, making your own printable jar labels is the easiest thing in the world. As well as being great jam jar labels, these pretty, printed doilies are great for presenting your homemade gifts in a jar. Best of all, they look good enough to eat! *Warning! Think twice about doing this project. Some printers are more temperamental than others and some paper doilies are weaker than others. This project could potentially destroy your printer – but you can’t go through life worring about every little possibility. My printer (a little black-and-white home laser) handles this project without even blinking. Just like you need to know your oven before making a tricky sponge cake, know your printer before you try this project. This entry was posted in Craft, Craft Tutorial, Preserves and tagged Craft, Craft Tutorial, Gifts in a Jar, Homemade Jam, Preserves. Bookmark the permalink.